There are plenty of places in America that boast fresh, fabulous seafood. You might think of Maine, Boston, and Baltimore, or New Orleans, San Francisco, and Seattle. But where you really need to start is with the letter A – for Alabama – because the Alabama seafood scene at Gulf Shores restaurants is nothing short of exquisite. Living in rural, western New Jersey, salmon and canned tuna are the extent of my family’s fish repertoire. I don’t consider myself a fish lover and normally shy away from ordering it when I travel. But my visit to Gulf Shores Orange Beach, on the Alabama Gulf coast, showed me what I’d been missing. My first meal in Alabama was at Cosmos in Orange Beach. A cozy spot featuring live music and a big deck for outdoor eating, Cosmos pours a wide range of craft beer and delights you with colorful artwork at every turn. 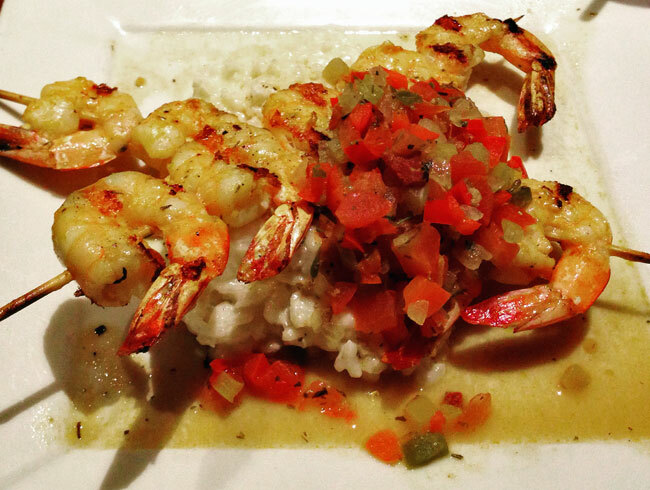 While the menu tempted the seafood lovers with catish, redfish, crab cakes, and tuna, I played it safe with annato and citrus marinated, grilled, jumbo shrimp served over risotto. My kids, ages 10 and 16 at the time, played it even safer with ribeye steaks. The next morning it was time to take on a little more culinary adventure. I headed to the Brick & Spoon with a friend. Named one of the “Top 10 Breakfasts in the US” by Travel + Leisure, this Orange Beach restaurant’s claim to fame is its “build your own Bloody Mary.” You’ll get a pencil and a handy checklist to help you choose from the 11 vodkas, 17 fruits/veggies, 7 herbs and seasonings, 9 meats/cheeses, and boiled or deviled egg. Now that’s the way to start your day. I’d never seen a “starter” menu for breakfast, but the Brick & Spoon had one. 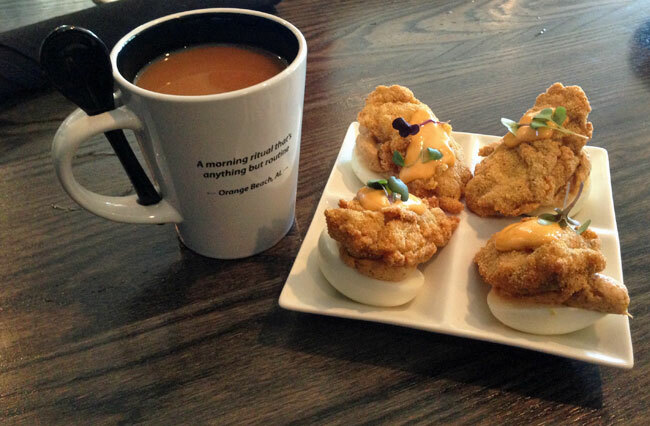 We chose to sample Deviled on the Bayou – tasso deviled eggs topped with fried oysters & sriracha aioli. I’m not a fan of deviled eggs and I’d never eaten an oyster in my life, so I was definitely heading out of my comfort zone. The oyster was pretty tasty, though I could have done without the egg. Pleased with myself for stretching my food boundaries with the oyster, I ordered Stuffed French Toast Sliders for my breakfast “entree.” The slightly crisp, battered French bread was layered with cream cheese and topped with blueberry compote, fosters sauce, whipped cream, and powdered sugar. Everything at the Brick & Spoon was delicious, but I’m definitely a sugar/carb-breakfast girl instead of a seafood-breakfast girl. It was dinner that night at Ginny Lane when I really expanded my horizons. Short Rib Nachos and Blackened Shrimp with Fried Green Tomatoes were our starters. My kids absolutely hoarded the nachos, but I didn’t mind because the shrimp were out of this world! 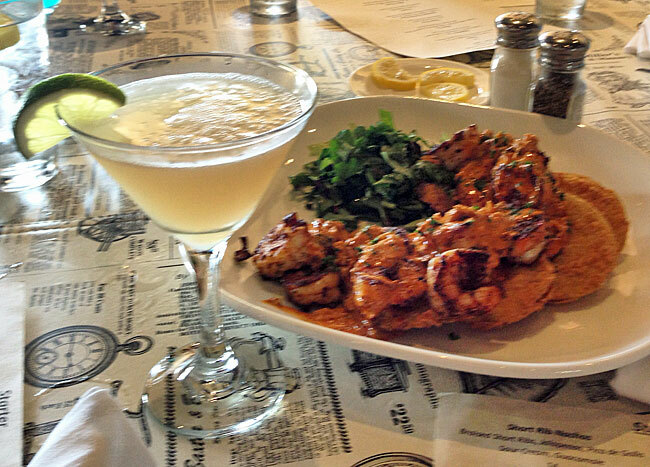 The perfectly seasoned shrimp and the crispy, but warm and juicy, tomatoes were topped with a to-die-for remoulade. Not your typically mayonnaisey remoulade, this version was tomato-based with just a little creole kick. My mouth still waters when I think about it. Sadly, I no longer see this item on the menu at Ginny Lane, so when I get back to Gulf Shores Orange Beach, I’m going to have to hunt down the chef and beg. 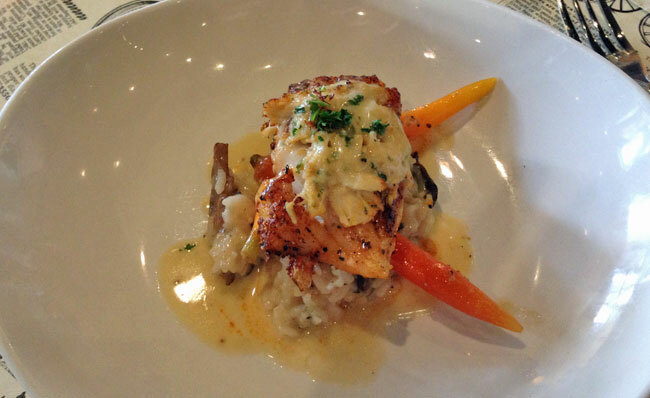 The main course was Chef’s choice – a flaky, moist, blackened grouper topped with crab and served over mushroom risotto. Now remember, my family has rarely ventured beyond salmon. You can imagine my surprise to see my kids digging in and devouring that grouper. It was at that point that I realized just how amazing fresh fish can taste when properly prepared. Grouper is delicious – even the kids went for it! If Ginny Lane expanded my seafood horizons, Fisher’s blew them right out of the water. Located in Orange Beach Marina, Fisher’s offers two distinct dining experiences: the casual Dockside and the upscale Upstairs. And if you’re looking for a pleasant food coma, this is the place to go. 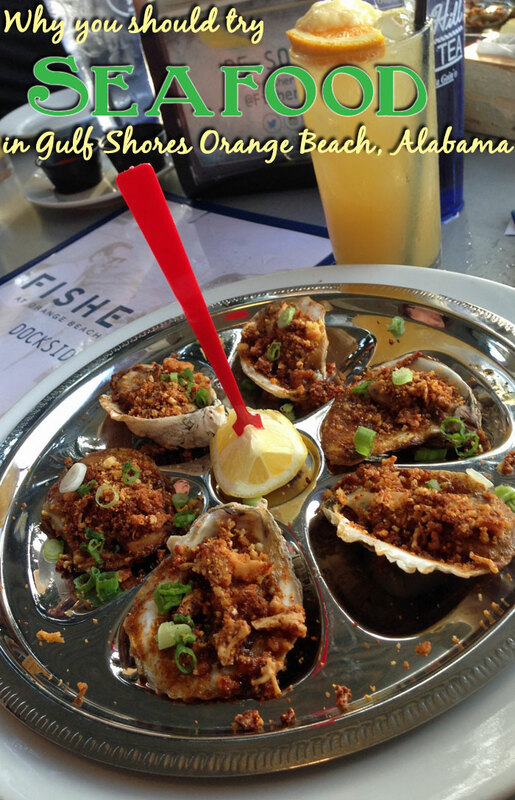 Fisher’s is my top pick of the Orange Beach and Gulf Shores restaurants that I visited. I had the luxury of trying out small samplings of many foods on the Dockside and Upstairs menus. At Dockside, I tasted cajun-roasted oysters, crab claws, boudin balls, boiled peanuts, and the famous Murder Point oysters – farm-raised to be small and sweet. I can’t say I’m an oyster convert, but the cajun-roasted were excellent, as were the crab claws. 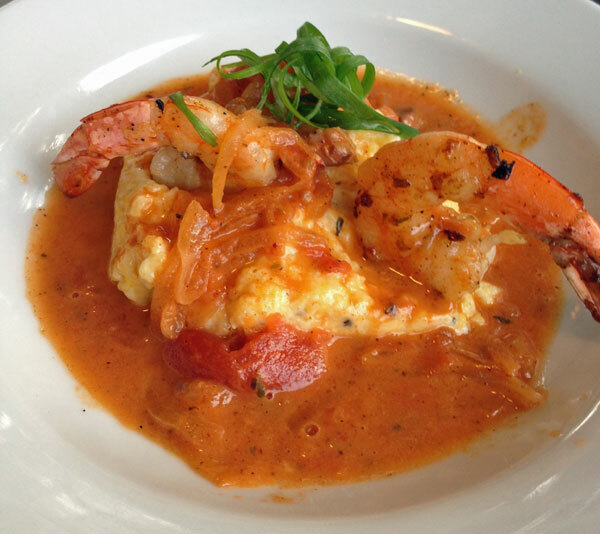 I also had a shrimp and grits dish that made me rethink everything I thought I knew about grits. Creamy, slightly firm, buttery, and seasoned to perfection, those grits live on in my memory, rivaling my mouth-watering recollection of the shrimp and fried green tomatoes at Ginny Lane. Upstairs at Fisher’s, I sampled Oysters Earle (sauteed in garlic leek butter – my favorite oyster yet! ), Jumbo Lump Crab Cakes with pancetta apple slaw, and Seared Jumbo Scallops. Every bite was a delight. They also offer a unique cocktail menu, my favorite being the Yacht Rocker: Luxardo Maraschino Liquer, rye whiskey, demarara, and blood orange bitters. The drink was served over a ball of ice that effectively chilled the cocktail, but didn’t melt too fast. Very cool. You know how your kids never want to leave the beach, but you’re ready for some adult food, beverage, and social time? LuLu’s Gulf Shores restaurant is the perfect place to achieve that elusive blend of family and adult time. 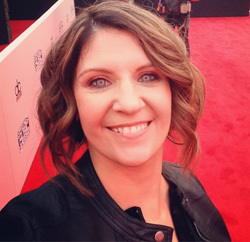 Founded by Jimmy Buffet’s sister, Lucy Buffet, LuLu’s is more accurately a “complex” – not just a restaurant. There’s a clmbing structure, arcade, face-painting and hair-wrapping stations, beach volleyball, a sand and water-play area, hoola-hoops, and more. Kids can also rent time in LuLu’s “Water Walkers” – inflatable balls (think hamster ball) that let them walk, roll and flip on the water without getting wet! At LuLu’s I enjoyed a phenomenal smoked tuna dip that I’ve been trying to recreate at home ever since, with no such luck. 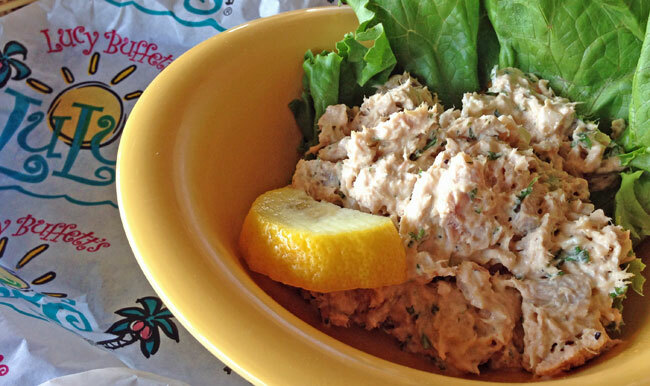 LuLu’s smoked tuna dip is divine. And don’t forget to try a Bushwacker. 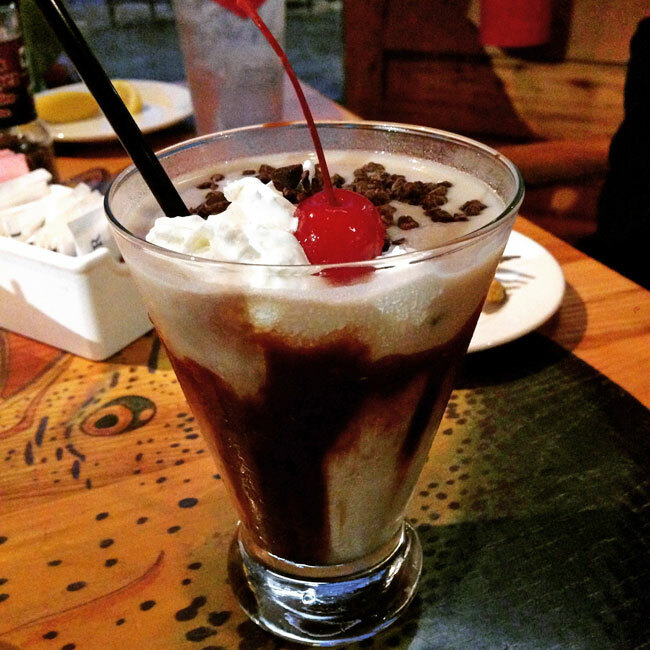 The mascot cocktail of Gulf Shores Orange Beach, the Bushwacker is made with rum, coffee and chocolate liqueurs, and vanilla ice cream, blended into a milkshake-like consistency. It’s the ultimate beach drink. I tried one at every restaurant (except for the Brick & Spoon), but still can’t say which one was best. The Bushwacker – signature cocktail of Alabama’s Gulf Coast. So what do I think of Alabama seafood after my visit to these Orange Beach and Gulf Shores restaurants? Oysters will probably not be a regular choice for me, but grouper, crab, and shrimp will definitely be on my menu. Even if you think you don’t love seafood, definitely give it a try in Alabama for an experience that may forever change how you look at a menu. Disclosure: I was a guest of Gulf Shores/Orange Beach, Ala. Opinions are all my own. This makes me hungry just looking at it!